Famous for its African Elephants - huge herds congregate in Duma Tau Camp along the waterways and lagoons. 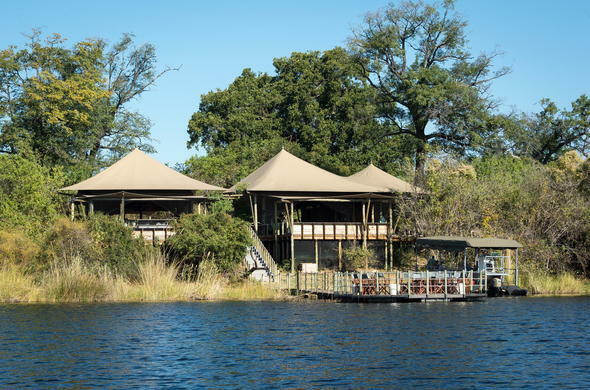 Duma Tau Camp boasts 10 tented units (8 twin and two family), situated in a 125 000 hectare private cocession bordering the Chobe National Park in northern Botswana. The grunting of Hippos provides pleasant background for guests staying at Duma Tau. The 10 luxuriously appointed rooms are raised off the ground and are under thatch with canvas walls. They have been designed to give maximum privacy, atmosphere and comfort. The bathroom facilities are en-suite and well appointed. Duma Tau camp is situated close to the confluence of the Savuti Channel and the Linyanti Waterways. Because of the wide variety of terrain in the area, activities are diverse and allow guests time on the water, on land and on foot. Day and night game drives are conducted in open 4X4 vehicles along the Savuti and Linyanti. The area is famous for its Elephants - huge herds congregate in the African safari winter along the waterways and lagoons- as well as at waterholes down the Savuti Channel where one might spot Lion, Leopard, Wild Dog and Cheetah. Two thirds of the Savuti Channel is situated within this reserve. The region has all the habitat diversity to make it a haven for wildlife. Duma Tau Camp is built under a shady grove of Mangosteen trees, overlooking a large Hippo filled lagoon within the Linyanti waterway system. There are excellent grasslands and waterholes along the Savuti Channel and along the Linyanti. Duma Tau Camp is built under a shady grove of mangosteen trees, overlooking a large Hippo filled lagoon within the Linyanti waterway system. There are excellent grasslands and waterholes along the Savuti Channel and along the Linyanti.